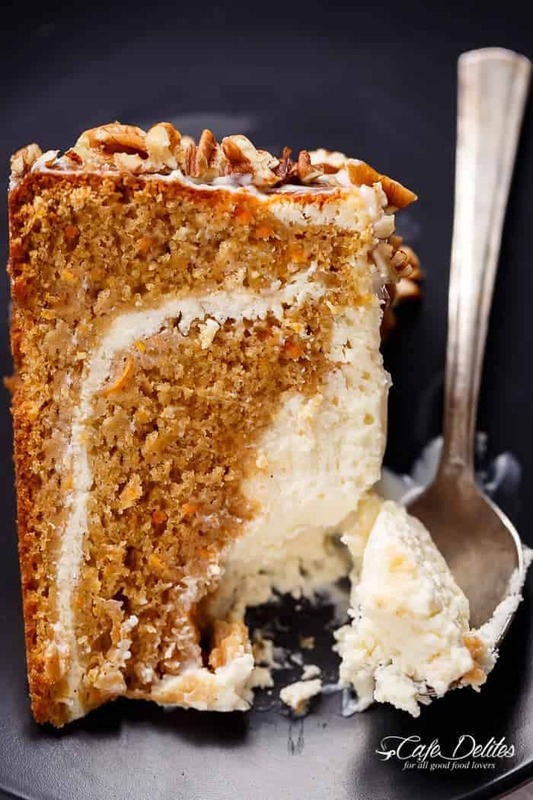 Carrot Cake Cheesecake is a fluffy and super moist carrot cake layered with a creamy, lemon scented cheesecake. The BEST of both worlds! 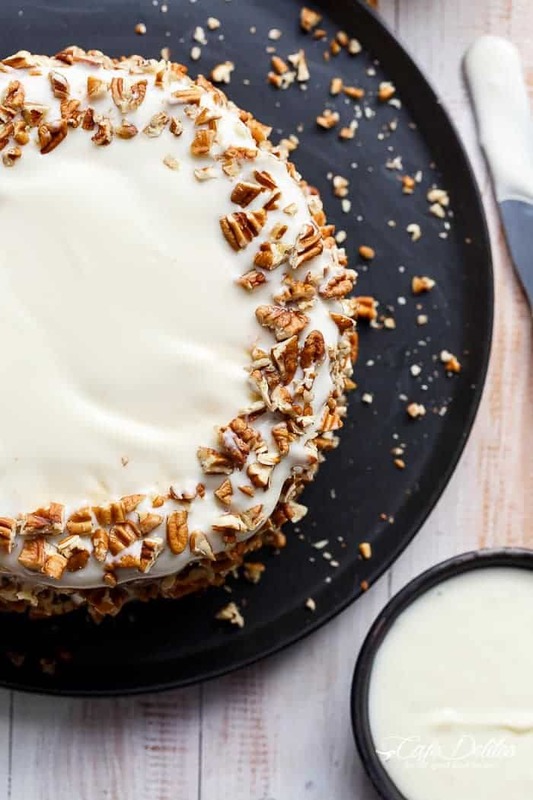 Carrot Cake Cheesecake smothered with a cream cheese frosting and crushed pecans to add crunch, this impresses everyone. Especially when slicing and seeing those perfect layers of soft, creamy cheesecake AND carrot cake in one! A few of you have emailed me, planning your Easter menus with the One Pan Lemon Garlic Salmon and Asparagus and those Crispy Garlic Butter Parmesan Smashed Potatoes. You’ve also been asking me for a dessert, and its not in my nature to leave you hanging. Having said that, the Nutella Stuffed Chocolate Chip Skillet Cookie would be a good idea and a definite crowd pleaser, or Nutella Churro Donut Holes, Strawberry Cheesecake Donut Holes or a 3-Ingredient Chocolate Mousse come to think of it! But this cheesecake is my gift to you. With all of the carrot cakes floating around on the world wide web lately, I wanted to make this cake for those of us wanting to enjoy our Easter weekend with less guilt than normal carrot cakes, but still so decadent that your family would never guess this is lower in fat! Well, mine had absolutely no idea. Inspired by The Cheesecake Factory, this cake is safe for all of us to eat! The original adaption calls for a lot of oil, but I’ve cut the oil down to 1/3! 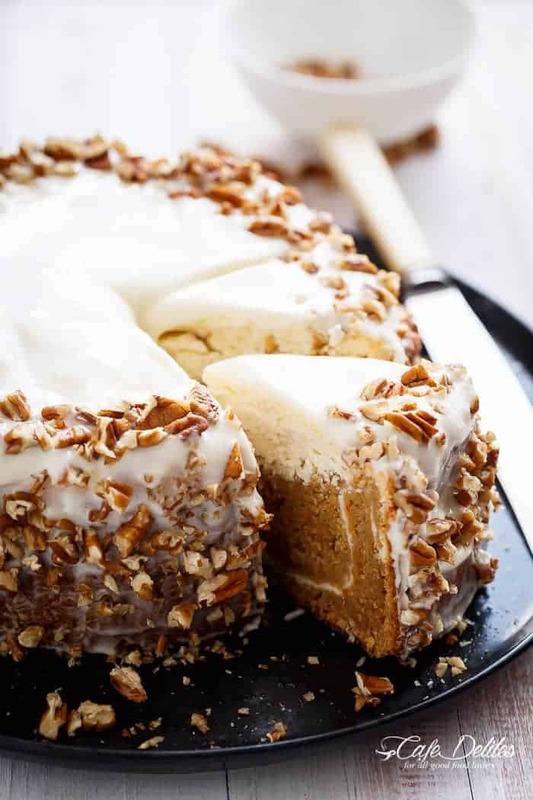 You can also keep this carrot cake cheesecake lower in calories and WW points with a natural granulated sweetener OR use normal sugar — it’s up to you! Our Easter family tradition is made up of seafood and Flan (Creme Caramel) with shards of toffee on the top, or Rice Pudding (Arroz Con Leche) for dessert. Now we’re breaking traditional and having Carrot Cake Cheesecake. Carrot Cake Cheesecake! 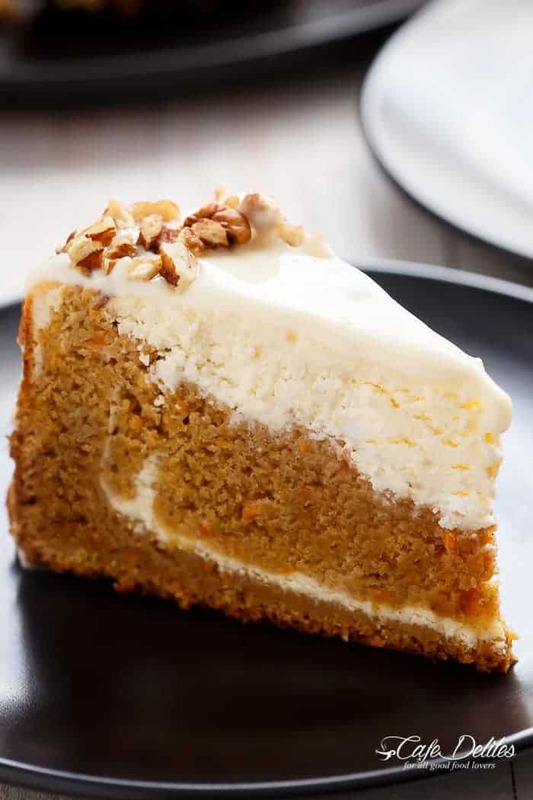 A fluffy and super moist, lower in fat, lighter in calories carrot cake layered with a creamy cheesecake. The BEST of both worlds! Weight Watchers Smart Points PER SLICE (not including frosting): 5 if using sweetener OR 8 if using normal sugar. Preheat oven to 175°C | 350°F. Lightly grease an 8-inch round springform pan wit cooking oil spray, line with baking paper and set aside. In a large bowl, whisk together flour(s), cinnamon, baking powder, baking soda and salt until well combined. In a separate bowl, mix together the oil, applesauce, almond milk, eggs and vanilla. Whisk the granulated sweetener (or sugar) and coconut sugar (or brown sugar) into the wet ingredients, and beat until well combined. Add in the dry ingredients and the grated carrots, mixing to form a smooth batter. Evenly pour half of the carrot cake batter into the prepared pan. Pour 1/3 of the cream cheese mixture over carrot cake layer (don't swirl it through). Spoon remaining carrot cake mixture over cream cheese layer, then pour the remaining cheesecake mixture over the carrot cake layer to completely cover. Beat all cream cheese ingredients together until smooth. Spread the frosting evenly over the top and sides of the cheesecake. Decorate with chopped pecans or walnuts. Can be prepared up to two days before serving. I made the carrot cake cheesecake and it was a hit. I totally agree that it is the best of both worlds! Thank you for the recipe. This cake looks delicious! Can this recipe be frozen after it’s baked? Hi Dana. That’s a great question! We never have any leftovers to test this out, but I’m sure you could freeze it in portions and thaw, reheat when needed. Enjoy! Hi Danielle! How about sour cream? Can I just use cake flour or regular flour? Yes, that shouldn’t be a problem at all. Enjoy! I’m trying to add this to the WW app under the freestyle program. It require you to enter the nutrition information you listed along with the Saturated Fat. Any idea what this number would be? Thanks in advance. I forgot to rate this recipe & to let you know that I tried so so many of your recipes from desserts (Cheesecake Stuffed Chocolate Chip Skillet Cookie, Chocolate Chip Skillet Brookie, Best Fudgy Chocolate Cake, Carrot Cake Cheesecake) to savory dishes ( One Pan Lemon Thyme Chicken Asparagus, Easy Sheet Pan Chicken Cordon Bleu, Easy Creamy Porkchops, Easy Baked Chicken Breast, Creamy Parmesan Carbonara Chicken, Creamy Herb Chicken, Milanese, Pan Seared Garlic Butter Steak, Swedish Meatballs). Your recipes never let me down. Thank you so much, Karina! Greetings from the Philippines! 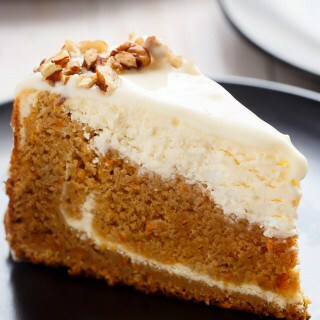 I’m sooo in love with this carrot cake. I made it 5x already and I’m planning to make it again. My question is can i use cake flour instead of all purpose and whole wheat flour because i have so much cake flour in my pantry that will soon expire. Thank you for this delicious recipe, Karina. That is so great to hear! I am so glad that everyone loved it! Thank you for sharing and following along with me! I hope you had a great Mother’s Day! Is powered natural sugar just powdered sugar or regular sugar? Could you make this in cupcakes? I Shazamed it but got no result…would you please say the name of the song and artist? I only have a 9″ springform and I am making it as a birthday dessert so I don’t want it to be too flat. Is it high enough to be made in a 9″ and not end up too low? you had made this awesome cake. Hi. Any advice on how I could turn this into a pumpkin cheesecake. I love the idea of the layers. Hi Kara! You’ve got me thinking now! Yum! I’ll start testing a recipe out and hopefully post one soon! This was the first time I had ever baked a cake or any type of dessert. I made it for a family get together and everyone loved it. I followed the recipe exactly as it was stated and it turned out great! Oh no Zainab! How did it turn out?! Could i use a 9 inch springform pan? Hi Andy, yes that should work out fine! I made this for Easter dessert. I followed the recipe exactly and it came out perfect. It’s not too sweet, which I like. The cheesecake layer is a little wetter than a normal cheesecake because of the Greek yogurt but I love Greek yogurt so I didn’t mind. All in all, very tasty. This may sound silly but when do I take the cake from the pan? I would guess after its been in the refrigerator overnight because by then it would have set. Please let me know soon as I’d love to make this next week. Hi Patricia. Not silly at all. Yes, take it out of the pan after it’s been refrigerated 🙂 I hope you like it! Can I just omit the wholewheat flour and use regular flour? Does this change anything specifically, besides calories? Words can’t describe my first look at this delectable creation!!!! I pinned it 3 times……..couldn’t decide on just one photo. Love carrot cake and cheesecake….winner. Thanks for sharing this recipe. Aw thank you so much Mary! I’m so happy you liked it! I hope you try the recipe! I’m eating a slice right now as I type! Can this be made successfully gluten free? Yes I’m sure it can be. Do you normally substitute flour for gluten free flour when baking? If so, the conversions you use can easily be modified for this recipe 🙂 I haven’t baked with Gluten free flour myself unfortunately! Hi, just wondering if these could be made in cupcake form? Do you know what the baking adjustment would be, and would the cheesecake work in paper cupcake liners?